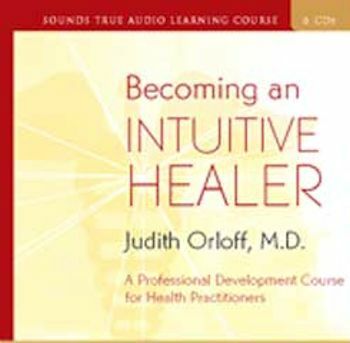 For Health-Care Practitioners, an In-Depth Audio Workshop for Integrating Intuition into Your Health-Care Practice. Doctors, nurses, bodyworkers, and therapists have all felt it at least once – the uncanny gut instinct about what’s ailing a patient or client. But what if there were a way to consciously tap this intuitive power and make it a regular part of diagnosis and treatment? For more than 20 years, Dr. Judith Orloff has pioneered the use of intuition in health care. With Becoming an Intuitive Healer, she now presents a full-length audio workshop about the indispensable role of intuition in healing. The use of intuition in healing is rooted in the universal ability to receive and process information in both linear and nonlinear ways, begins Dr. Orloff. The linear, or analytic, mind plays an essential role in understanding the didactic knowledge and training specific to the health-care profession. However, there is an infinite amount of wisdom we cannot access through logic alone. Instead we must learn to rely on our nonlinear, or intuitive, mind to create a complete picture of the person we’re trying to help. The days of going to the doctor to find out what’s wrong and how to fix it are thankfully coming to a close, explains Dr. Orloff. Today, an ever-increasing number of health-care practitioners recognize the vital need for an “us” in the therapeutic relationship. Recorded at an in-depth four-day training, Becoming an Intuitive Healer gives you all the skills and insights required to use your intuition in conjunction with conventional knowledge.